Information: This publication was a special bound volume of three months' worth of the French "Battle of the Planets" magazine. You can see examples of the original magazine here. It is unknown how many editons of the magazine, or how many bound editions were issued. In additon to "Battle of the Planets" comic stories, each magazine also featured various other French comics, articles on popular music groups of the time, a calendar page for the specific month with a "Battle of the Planets" image and finally, "Battle of the Planets" puzzles and games. Full color and duotone. 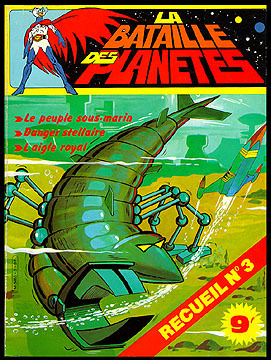 Contents: Three 15-page "Battle of the Planets" comic stories; "The Underwater People," Stellar Danger" and "The Royal Eagle."